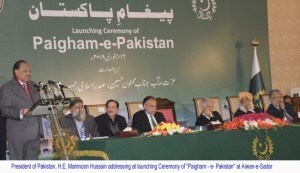 A narrative and decree against terrorism and extremism (Paigham e Pakistan) issued by Muftis and religious scholars of all schools of thought with the efforts of Islamic Research Institute (IRI) of the International Islamic University, Islamabad (IIUI) was launched at Aiwan e Sadar on Tuesday in a ceremony chaired by President of Pakistan Mamnoon Hussain. Unanimous fatwa by 1829 scholars condemning extremism and terrorism declared the supporters of suicide bombing as traitors, the religious decree defined jihad as being the purview of the state and disallowed the use of force to compel obedience to Islamic laws. The declaration said the soil of the Islamic Republic of Pakistan should not be allowed to be used by any group for promoting terrorism. It also called for offering protection to the life and property of the non-Muslims in Pakistan. It called for tolerance and promotion of justice and fairplay in Pakistan. The declaration said the use of force and waging armed struggle in the name of enforcing Shariah and also acts of terrorism and sabotage in any shape exploiting linguistic, regional, religious and sectarian differences were against Shariah and un-Islamic and amounted to rebellion against the Constitution and the law. It noted that imposing one’s views and ideology on others was against the teachings of Shariah and was akin to spreading chaos. The declaration said that no individual and group had the right to take law into its hands or set up a parallel court system. Religious scholars and Muftis declared unanimously that suicide attacks, armed insurgency against the state and the use of force in the name of enforcing Shariah was ‘Haram’ or forbidden in Islam and this announcement was named as ‘Paigham-e-Pakistan’ (Message of Pakistan). The effort is being termed a second biggest historic consensus among all the sects after 1973 constitutions. 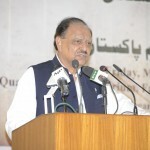 President Mamnoon Hussain on Tuesday launched said the national counter-terrorism narrative would help eradicate terrorism and prove instrumental in reforming the people who lost their path due to negative propaganda of aberrant elements. President of Pakistan said the decree prepared by religious scholars and Wafaqul Madaris after thorough consultations was a step in right direction reiterating that Pakistan was an Islamic state believing in peace, tolerance, justice and love. The President said the launch of national narrative on counter-terrorism manifested that the whole nation was extremely serious on the issue and would be successful in achieving its objectives through unity. He said according to Islamic teachings, extremism, bloodshed and suicide-bombing were categorized as spreading evil on earth (Fasaad-fil-Ard), which was categorically prohibited and unjustified. He said the decree would not only promote positive image of the Islamic teachings and Pakistani society in the world but would also help in overcoming the menace of extremism. 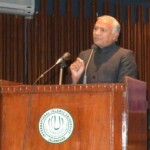 He expressed satisfaction that under the Paigham-e-Pakistan, different religious schools of thought had unanimously prepared an impressive document in light of the teachings of Quran and Sunnah whereby rationale behind sectarianism and use of religion for spreading evil on earth stood rebutted and the true face of Islam was revealed. The President pointed out that the state and its institutions to a certain extent fell short of discharging their responsibilities during 1970s to 1990s which resulted in several complexities. He said the nation sacrificed 70,000 precious lives and suffered huge financial loss due to terrorism and urged all segments of the nation to make a resolve not to repeat such mistakes. He said the roots of extremism and militancy lied in intolerance and in not appreciating different points of views, which fostered sectarianism by eliminating moderation. He mentioned that renunciation of research, dogmatism and intolerance resulted in dreadful forms of sectarianism. The President said it was imperative that religious scholars, intellectuals and all institutions of the state must be vigilant and apart from individual efforts, should collectively work with mutual consensus to safeguard the nation against divisiveness. He said the country’s Constitution provided a strong foundation for national unity and communal harmony, and was the fundamental narrative based on the teachings of Quran and Sunnah and on the sagacity of Quaid-e-Azam Muhammad Ali Jinnah. He regarded the Constitution as the essence of Charter of Medina and the agreement between the Holy Prophet Muhammad (Peace be upon Him) and the Christian tribe of Najran. “It is our foremost responsibility that we must hold this foundation (Constitution). It is the base which will provide us the strength to achieve a dignified place amongst the comity of nations and enable us to meet the challenges at national level,” he said. He also hailed Islamic university and IRI for untiring efforts in the preparation of the Paigham e Pakistan. The event was also addressed by Interior Minister, Ahsan Iqbal who said that peace was imperative for the progress. He urged for self accountability while stressing the devotion for the cause of country. He maintained that announcement of war and punishment was only the prerogative of state. Foreign Minister Khwaja Asif said that Pakistanis have shown to the world that they were united and the decree was its visible symbol. He added that that all the institutions and whole nation was one against the menace of terrorism. He added that there was a contrast in Islam and terrorism because Islam was religion of peace while the terrorism leads towards devastation. IIUI Rector Dr. Masoom Yasizai read important points of the decree and said the President of Pakistan had asked the university to come up with a unanimous decree. He also said that national narrative against terrorism was a continuous process and all the institutions were helpful and supportive in creation of this narrative. He also explained about the plan of dissemination of Paigham e Pakistan decree across the world. Senator Raja Zafarul Haq, Maulana Fazlur Rehman, Mufti Munibur Rehman, Maulana Abdul Malik, and Chairman Higher Education Commission Dr Mukhtar Ahmed also spoke on the occasion. Earlier, Director General, IRI Dr. Zia ul Haq briefed the audience about the stages of the preparation of Paigham e Pakistan. He thanked IIU leadership and other institutions for cooperation during the process of preparation of this narrative.